Archbishop Charles Chaput blesses the Oil of the Sick and the Oil of Catechumens at the Chrism Mass March 28, 2013. 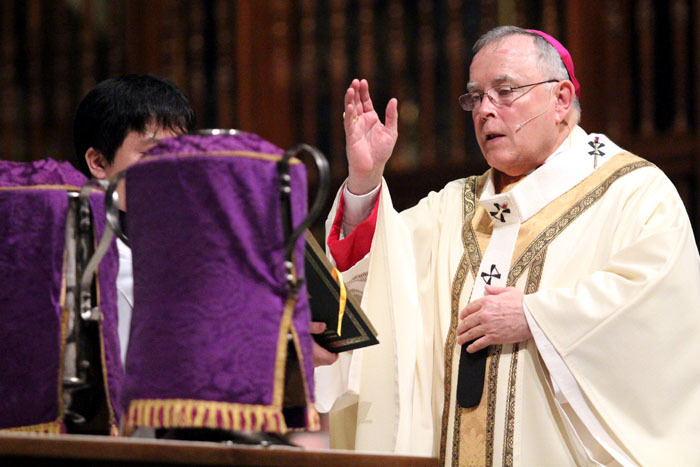 Archbishop Charles Chaput will celebrate liturgies for the Sacred Triduum – Holy Thursday, Good Friday and Holy Saturday – plus Easter Sunday at the Cathedral Basilica of SS. Peter and Paul this week. All are invited to the liturgies at the cathedral. Check a list of parishes in the archdiocese and find a Catholic church near your home. Check each parish website or call for times of the liturgies in each church. The following Holy Week liturgies will be celebrated at the cathedral, located at 18th Street and the Benjamin Franklin Parkway in Philadelphia. Holy Thursday, April 17: Chrism Mass – Procession at 9:40 a.m., Mass at 10 a.m.
Archbishop Chaput will be the principal celebrant and homilist. All archdiocesan priests are invited to gather and concelebrate with the archbishop and to renew their priestly promises. During the Mass Archbishop Chaput will bless the Oil of Catechumens and the Oil of the Sick as well as consecrate the Oil of Chrism. These holy oils will be used throughout the archdiocese during the coming year in the celebration of the sacraments. 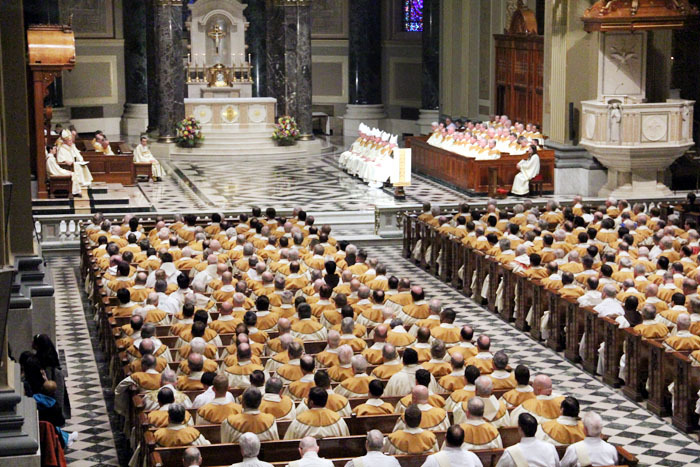 The Chrism Mass will be streamed live on the website of the archdiocese (at archphila.org) and broadcast live on the Catholic Channel on Sirius XM radio and Holy Spirit Radio 1420 AM and 1570 AM. Holy Thursday, April 17: Mass of the Lord’s Supper – 5 p.m.
Archbishop Chaput will be the principal celebrant. This Mass commemorates the Last Supper, during which Christ instituted the sacraments of the holy Eucharist and holy orders, and gave his commandment to love one another. The homily will be preached by Father Edward Burke, parochial vicar at the Cathedral Parish. Following the example of Christ who washed the feet of the apostles at the Last Supper, the archbishop will wash the feet of seminarians from St. Charles Borromeo Seminary. Good Friday, April 18: The Passion of the Lord – 3 p.m.
Msgr. Arthur E. Rodgers, rector of the cathedral, will be the principal celebrant and homilist at the Solemn Liturgy of the Lord’s Passion, commemorating the passion and death of Jesus Christ. The traditional Adoration of the Cross, led by Archbishop Chaput, will take place during the liturgy. There will be three hours of prayer in the cathedral from noon to 3 p.m., during which confessions will be heard. Holy Saturday, April 19: The Easter Vigil Mass – 8 p.m.
Archbishop Chaput will be the principal celebrant and homilist at the Easter Vigil Mass celebrating the resurrection of the Lord. The Easter Vigil contains four components: Service of Light (Blessing of the Fire and Lighting of the Paschal Candle), Liturgy of the Word, Liturgy of Baptism and the Liturgy of the Eucharist. After a reflective and intense period of prayer during Lent, catechumens (those who have not been baptized) and candidates (those who have been baptized) will become full members of the Catholic Church at the cathedral and parishes throughout the archdiocese at the Easter Vigil and during Easter time. This year almost 700 new Catholics will be welcomed into the Church. Sunday, April 20: Easter Sunday Mass – 12:30 p.m.
Archbishop Chaput will be the celebrant and homilist for the Mass of the Resurrection of the Lord. Other Masses on Easter Sunday are: 8 a.m.; 9:30 a.m.; and 11 a.m. There will not be a 6:30 p.m. Mass.